Fayetteville Public Library officials recently announced plans for an event to unveil a ‘major gift’ toward their library expansion capital campaign. A groundbreaking for the Fayetteville Public Library’s expansion will take place despite a wet weather forecast. The stretch of road was vacated by the city to make room for the expanded library. Jordan dedicated his remarks to honoring the City Hospital property, which he said had been a cornerstone of the Fayetteville community since 1912. 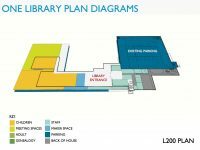 Fayetteville Public Library officials on Monday released the initial layout concepts for a planned expansion to the 14-year-old facility. Residents are invited to weigh in on the design of a planned expansion of the Fayetteville Public Library. Washington Regional Medical Center on Wednesday officially transferred ownership of the former City Hospital property to the Fayetteville Public Library. The Arkansas Supreme Court on Thursday upheld a lower court ruling that clears the way for a planned expansion of the Fayetteville Public Library. Voters approved a millage increase Tuesday that will help fund an expansion of the Fayetteville Public Library. Fayetteville voters can choose from any of the six approved polling sites in the Aug. 9 library millage special election. Residents this week are getting their first look at what an expanded public library might look like near downtown Fayetteville. Residents are invited to review and discuss the newest plans for an expanded Fayetteville Public Library during three input sessions scheduled this week. Fayetteville voters will head to the polls this summer to decide whether to increase property taxes to help fund an expansion of the city’s public library. Fayetteville voters may soon head to the polls to decide whether taxpayers should help pay for a major expansion of the city’s public library. The Fayetteville Public Library will host three public meetings in September to gather feedback and input about a future expansion plan for the 10-year-old library. The estimated $50 million expansion project would nearly double the size of the library by early 2018. Those hoping for an expanded public library in downtown Fayetteville can breathe a sigh of relief.